Shrimp Egg Roll, Cha Gio Cuon Tom, is a super simple Vietnamese appetizer. It is whole shrimp, marinated in a quick sauce, rolled in egg wrappers and deep fried. It comes with a side of a sweet chili dipping sauce. It's fancy. It's delicious. Best of all, it's super simple to make that is guaranteed to impress a crowd. I made the mistake of making a small batch. Avoid the fist fights, make two or three batches. This recipe uses only five ingredients: Shrimp, egg roll wrapper, oyster sauce, sugar and an egg. I usually make this dish when I have a couple of hours of peace and quiet. I gather everything together, set up an assembly line, prop myself in front of a TV with reruns of Friends running and roll away. These shrimp egg rolls are best served immediately after frying to retain the crunch. However, if you have leftover, you can bake them in the oven to get back the crunch. You can also assemble the egg rolls a day ahead and fry them up the next day. Peel and devein the shrimp. Leave the tail on to make a "handle". In a bowl, add the shrimp, oyster sauce and sugar. Marinate for at least 15 minutes. In a small bowl, mix the egg with a fork. Set aside. Follow instructional pictures below to assemble. Deep fry the shrimp egg rolls at 375 F for about 2-3 minutes per batch or until golden brown. 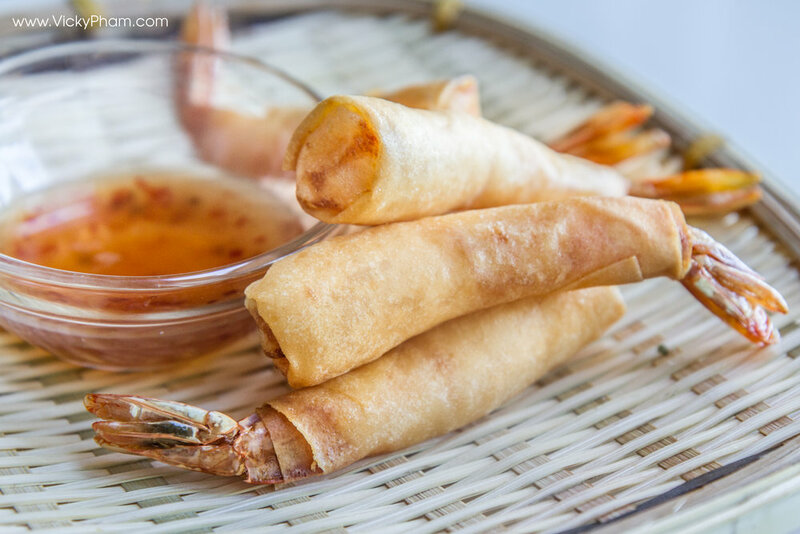 Remove the shrimp egg rolls from the oil and drain on a plate lined with paper towels. Serve immediately with a side of sweet chili dipping sauce. Devour the shrimp egg rolls and smile widely. Step 1 - Cut the stack of egg roll wrappers in half at a diagonal. Then separate the wrapper into individual sheets. Step 2 - Place a shrimp at the end of a corner with the tail sticking out. Then roll up. Step 3 - At the midway point, pull the top corner of the wrapper over the shrimp. Step 4 - Continue rolling up. Place a bit of egg wash at the end of the last corner to seal the wrapper together. You should have an shrimp egg roll that looks like this. Fry each batch for about 2-3 minutes until golden brown. Vietnamese Egg Rolls are marinated ground pork rolled in wheat wrappers and deep fried. It can be eaten as a main dish with a sweet and spicy dipping sauce (Nuoc Mam Cham) or as a component to a main dish like Vietnamese Grilled Pork with Vermicelli Noodles (Bun Thit Nuong). Vietnamese egg rolls filling may also include ground shrimp, chopped jicama, shredded carrot and cabbage. This recipe is a basic traditional recipe of ground pork, minced woodear mushroom and thin rice vermicelli noodles. Vietnamese Steamed Rice Rolls or, Bánh Cuốn, are thin sheets of steamed rice batter filled with ground pork, jicama and wood ear mushrooms. The rice rolls get a glaze of scallion oil and a sprinkle of crispy fried shallots, then served on a bed of fresh thinly sliced cucumbers, chopped lettuce, Vietnamese herbs, blanched bean sprouts and slices of Vietnamese sausage (Chả Lụa). All of this is served with a side of Vietnamese fish sauce dipping sauce (Nước Mắm Chấm). Vietnamese Spring Roll or Goi Cuon Tom Thit is a refreshing appetizer made up of shrimp, pork, vermicelli noodles, and an assortment of vegetables rolled in rice paper. They are served at room temperature with a side of peanut dipping sauce or alternatively, Vietnamese fish sauce dipping sauce. This dish is best eaten in Spring and Summer when fresh herbs such as Perilla, Sorrel, and Chinese chives, are plentiful and cheap. Vietnamese Steamed Pork Buns, or Bánh Bao, are fluffy savory buns made with ground pork, mushrooms, hard boiled eggs and Chinese sausages. It's simple and delicious on-the-go food. Everything you need in a meal conveniently fits in the palm of your hand. Xiao Long Bao, also known XLB for short or Little Dragon Buns for a literal translation, are steamed dumplings made of ground pork and pork broth. The common question with XLB is how they get the broth inside the dumpling. The answer fascinated me and many others. To get the broth inside the dumpling, the pork broth is made ahead of time from slowly simmering pork bones with skin on them. The broth is then chilled and the gelatin from the pork skins solidifies the pork broth. It is cubed up then mixed together with the ground pork filling. The filling is encased into a thin flour wrapper and then steamed in a bamboo basket. Vietnamese Jicama and Carrot Springs Rolls, or Goi Cuon Bo Bia, is a refreshing and healthy traditional Vietnamese appetizer and snack. It is rice paper wrapped around julienned jicamas and carrots, Chinese sausages, dried shrimp, ribbons of fried eggs and Thai basil. Banh Trang Nuong, or Vietnamese Pizza, is a popular street food among young people in Vietnam. It resembles pizza with an assortment of fun toppings. However, instead of a thick dough as the base, you have a thin sheet of rice paper. Instead of tomato sauce, you have a quail or chicken egg beaten directly on top of the rice paper and spread evenly. The egg prevents the rice paper from burning, and it serves as a glue for the toppings. There's no right or wrong topping. Some people like to add a Western spin with cheese and cut-up hot dogs. Whereas I like to keep mine very traditional with exotic Southeast Asian flavors, such as fermented shrimp paste (Mam Ruoc), dried pork, and Sriracha sauce. Banh Khot, or Vietnamese savory mini pancakes, is made from a batter of rice flour, corn starch, tumeric powder and coconut milk. The batter is fried on a cast iron Banh Khot or Aebleskiver frying pan to crispy perfection on the outside and fluffy on the inside. These mini pancakes are topped with shrimp, brushed with scallion oil and sprinkled with a dash of toasted minced dried prawns. They come with a plate stacked high in Vietnamese herbs and a small bowl of spicy and sweet dipping sauce. 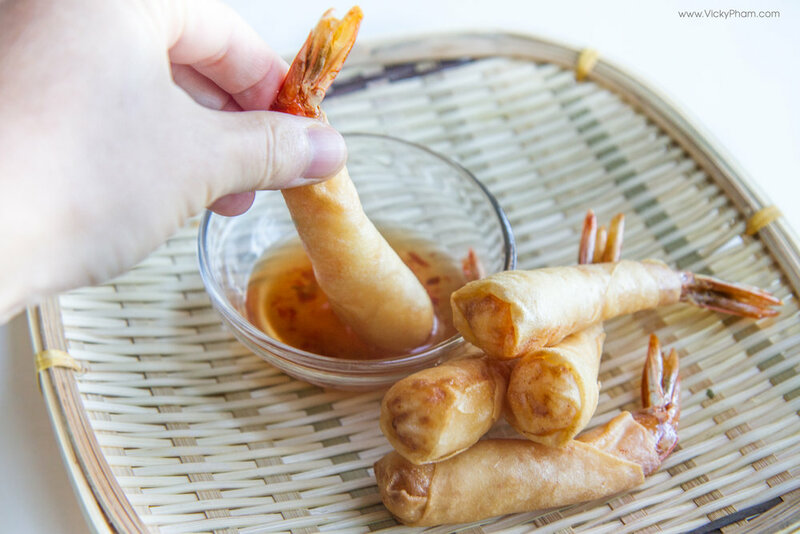 Shrimp Egg Roll, Cha Gio Cuon Tom, is a super simple Vietnamese appetizer. It is whole shrimp, marinated in a quick sauce, rolled in egg wrappers and deep fried. It comes with a side of a sweet chili dipping sauce. It's fancy. It's delicious. Best of all, it's super simple to make that is guaranteed to impress a crowd. Pot stickers are mini meals that are easy to make and easy to eat. The fillings are soft and moist, and the wrapper is thick and chewy. Plus, the dumplings are versatile. You can use any type of ground meat and any type of vegetables. Made too many? Pop the uncooked ones in the freezer and they can keep for months!